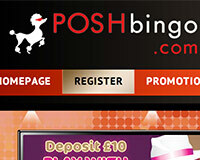 Posh Bingo is an online bingo powered by 888 Holdings, Evolution, Eyecon, IGT, NetEnt, PariPlay, SG Digital, SG Gaming and Williams Interactive owned by 888 Holdings Plc. 14 results for Posh Bingo. Withdrawal restrictions & Further T&Cs apply.